"Rebbie" redirects here. For American musician Rebby Sharp, see Orthotonics. Maureen Reillette "Rebbie" Jackson-Brown (/ˈriːbi/; born May 29, 1950) is an American singer. Born and raised in Gary, Indiana, she is the eldest child of the Jackson family of musicians. She first performed on stage with her siblings during shows in Las Vegas, Nevada, at the MGM Grand Hotel and Casino in 1974, before subsequently appearing in the television series The Jacksons. Her sister La Toya was born on her sixth birthday. At age 34, Jackson released her debut album Centipede (1984). The album featured songs written by Smokey Robinson, Prince, and Jackson's younger brother Michael, whose contribution (the title track "Centipede") became Rebbie's most successful single release. By the end of the 1980s, the singer had released two more albums in quick succession: Reaction (1986) and R U Tuff Enuff (1988). Following a 10-year hiatus in her musical career, Jackson returned with the 1998 album Yours Faithfully. The production of the album, her last to date, was a collaboration with artists and producers such as Men of Vizion's Spanky Williams, Keith Thomas, and Eliot Kennedy. It also featured contributions from her children. In 2011, Rebbie embarked on the Pick Up the Phone Tour, which is dedicated to teens from all over the U.S. who have committed suicide. Maureen Reillette "Rebbie" Jackson was born in Gary, Indiana, to a working-class family on May 29, 1950. The daughter of Joseph Walter "Joe" and Katherine Esther (née Scruse), she is the eldest of their 10 children. Her siblings are Jackie, Tito, Jermaine, La Toya, Brandon (d. March 12, 1957), Marlon, Michael (d. June 25, 2009), Randy, and Janet. Joseph was a steel mill employee who often performed in a rhythm and blues (R&B) band called the Falcons with his brother, Luther. His wife, Katherine, is a Jehovah's Witness and raised her children to follow the religion. Rebbie, La Toya, and Michael became the most devout of the children as time progressed. Reflecting on her early life, Rebbie acknowledged in a 1980s magazine interview that her role within the family had been that of a "second mother" to her younger siblings, whom she would often babysit, along with her eldest brother Jackie. She graduated from Theodore Roosevelt High school in Gary in 1968. Jackson began her singing career in 1974, performing with her siblings in Las Vegas. The Vegas shows had initially begun in April, without Rebbie; due to a sprained ankle, Rebbie's debut was postponed until June. Her five brothers were the main draws, with Rebbie, Randy, Janet, and La Toya serving as fillers for the performances. When the Jackson 5 parted with their record label Motown in 1976, they signed to CBS Records and rebranded themselves as the Jacksons. Additionally, the brothers were signed to CBS-TV to star with their family in a variety series called The Jacksons. 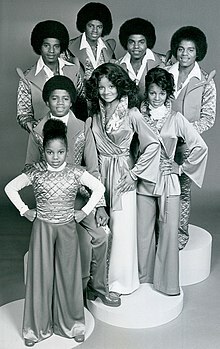 The shows premiered in June 1976 and featured all of the siblings excluding Jermaine, who had chosen to stay with Motown. The initial series run of the 30-minute programs was four weeks. Due to ratings success, more episodes were ordered in January 1977. The shows marked the first time that an African-American family had ever starred in a television series. The run of programs concluded shortly afterward. Prior to the series, Jackson had thought of her singing as merely a private hobby. Her television experience, as well as an early love of musicals, motivated her to become a professional recording artist, and the show's producer encouraged her to sing. Jackson served as a backing vocalist for several musicians around this time, as well as a cabaret singer. She contributed her voice for songs by artists such as the Emotions, Sonny Bono, and Betty Wright before her second pregnancy stalled her musical career for a short time. Following years of preparation, Jackson's debut album Centipede was distributed in October 1984 by CBS Records, which had signed her as a solo artist two years previously. The album was only released once the singer had ensured that family life was secure and that she had spent time with her children during their important younger years. Centipede became a moderate chart success, reaching number 13 on Billboard's Top R&B/Hip-Hop Albums chart and number 63 on its Top 200. The recording of the album had been a family affair; it involved several contributions from her relatives. Her husband Nathaniel Brown co-wrote the song "Come Alive Saturday Night" with two of his wife's brothers: Randy and Tito. The latter Jackson also penned "Hey Boy" with his wife Dee Dee. The most successful song from the album was the million-selling title track, "Centipede". Written, arranged, and produced by Michael, the song also featured Jackson's famous brother and the Weather Girls on backing vocals. It reached number 4 on the Black Singles Chart and was subsequently certified gold by the Recording Industry Association of America. "Centipede" marked Michael's first effort at writing and producing since the release of his successful Thriller (1982). Other tracks from Rebbie's album included cover versions of songs by Prince ("I Feel for You") and Smokey Robinson and the Miracles ("A Fork in the Road"). The album received mixed reviews from journalists and music critics. According to the magazine Jet, Centipede marked Jackson's emergence as a "legitimate recording artist" and "cleared the major hurdle of demonstrating that she [was] talented and marketable". With the album, Jackson became the last of her siblings to embark on a recording career and the last in line to release hit material. Rebbie later revealed that several discussions occurred at the time of the release of Centipede over whether she should use the Jackson surname professionally or not. To begin with, Rebbie did not want to use her maiden surname, but later reasoned that it was silly to deny her heritage. Jackson explained that she did, however, compromise with the use of her family name on the Centipede album cover – "Rebbie is large and Jackson is small". She further stated that the success of siblings Michael and Janet had not been a hindrance to her, but served as an enhancement to her career. Rebbie added that she did not have to worry about "name recognition". Reaction served as a follow-up album to Centipede, and was released in October 1986. The album was recorded at Tito's Ponderosa Studios in Los Angeles, California. Her brother Tito produced Reaction along with David Conley and David Townsend of the R&B group Surface. Duets were featured on the album, including one with Cheap Trick lead singer Robin Zander and another with Isaac Hayes. The Zander-Jackson collaboration ("You Send the Rain Away") was released as a single, and peaked at number 50 on the R&B singles chart. Jackson's duet with Hayes, the ballad "Tonight I'm Yours", was not released as a single, though received substantial airplay. Reaction's title track ("Reaction") was the most popular hit from the album, reaching number 16 on the R&B singles chart. The R U Tuff Enuff album succeeded Reaction upon its release in July 1988. Jackson was more involved with the production of the album than she had been on her previous releases. She stated at the time of R U Tuff Enuff's distribution that the sound on the album differed from anything she had done previously. Jackson commented that the album was "more versatile", while noting that it resembled other albums because it had a lot of dance music. Two singles were released from the album and charted on the R&B singles chart: "Plaything", which made it into the top 10, and the title track "R U Tuff Enuff", which peaked at number 78. By mid-June 1988, R U Tuff Enuff had reportedly sold 300,000 copies. MTV later concluded that the album "struggled". Jackson lent her vocals to "2300 Jackson Street" (the title track of her brothers' 2300 Jackson Street album), before taking a hiatus from releasing music. Jackson later stated that she performed around the world during this hiatus. When fans find out there's another Jackson coming out, they want to hear what the person is about. That can be a double-edged sword. Following a 10-year break from music, Jackson signed with her brother Michael's record label, MJJ Music, in 1997. From the label, Yours Faithfully was released on March 31, 1998. The album featured a remixed version of Jackson's successful "Centipede". Initially, the singer had not wanted to feature the track, believing that it was part of the past. After thinking about it for a while, Jackson felt that the inclusion of the remix – which features a rap by son Austin – would be a good way to return to the music scene. In addition, her two other children, Stacee and Yashi, contributed backing vocals for the album. Other tracks from the album included "Fly Away", which was written and produced by brother Michael, who also served as co-executive producer for Yours Faithfully. Fellow producers included Keith Thomas and Eliot Kennedy. The album also featured a duet with Men of Vizion's Spanky Williams on the Spinners' "I Don't Want to Lose You", which Jet described as being a "sizzling" rendition. Yours Faithfully's title track was released as a single and peaked at number 76 on the R&B chart. Vibe magazine's Quohnos Mitchell expressed disappointment in the album, labelling its content a "mix of dated R&B grooves dressed up with a few cleverly placed samples". Rebbie's brother Michael died on June 25, 2009, after suffering a cardiac arrest. His memorial service was held 12 days later, on July 7, and the finale featured group renditions of the Jackson anthems "We Are the World" and "Heal the World". The singalong featured Michael's siblings (including Rebbie) and the late singer's children. Following the service – which was held at Los Angeles' Staples Center – Rebbie, along with sisters Janet and La Toya, addressed fans at the nearby L.A. Live entertainment complex: "We are extremely grateful for all the support. We love you all." In the weeks following Michael's death, it was speculated by media sources that Rebbie would be the primary caregiver for her late brother's children, Prince, Paris, and Blanket. It was stated that even if Michael and Rebbie's mother Katherine were granted custody of the children, Rebbie would care for the siblings on a day-to-day basis at the Jackson family's Encino home. Katherine was named the legal guardian of them in August 2009 after the death of Michael Jackson. In early 2011, Rebbie announced she'd begun recording for a new album, her first in 14 years. She also performed throughout the states with a set list that contains her best-known songs, some of her brothers' songs, and some Motown classics. Rebbie Jackson is a contralto with a three-octave range. She has an impressive belting range, belting up to F#5 in her song "Reaction". The 18-year-old Rebbie's announcement that she wanted to marry her childhood love, Nathaniel Brown, in May 1968, created a division in the Jackson family. Jackson expressed her feelings for the man and proclaimed that she wanted to move with him to Kentucky. Katherine encouraged her daughter to proceed with the union; she felt that being a wife and mother were important roles for all of her daughters to play. Joseph, however, was against the marriage; he wanted Rebbie to follow in the footsteps of her brothers (the Jackson 5) and become a singer. Her father felt that married life would stop her from becoming a success in the entertainment business. Though Rebbie had taken clarinet, piano, and dance lessons in her childhood, she had no interest in a music career. This was despite the fact that, according to brother Jermaine, she had won several singing contests, duetting with brother Jackie. The teenager thought a happy home was more comforting and secure than the instability of show business. She also wanted to leave her family's drama-filled home on Jackson Street, as well as get away from her controlling father. Arguments ensued for several weeks before her father relented and allowed Rebbie to wed Brown. Having the last word on the matter, Joseph refused to walk his daughter down the aisle. Stacee Brown (born May 5, 1971). Yashi Brown (born October 5, 1977). Austin Brown (born November 22, 1985). Jackson's husband, Nathaniel Brown, died of cancer on January 6, 2013. Rebbie has one grandson, London Blue Salas (born July 25, 2005), from Stacee. ^ "Rebbie Jackson's Husband Nathaniel Brown Dies After Battle with Cancer". 8 January 2013. ^ Taraborrelli (2004), pp. 11–14. ^ Taraborrelli (2004), p. 15. ^ Taraborrelli (2004), pp. 17–18. ^ "Rebbie Jackson goes back to Gary home, talks about famous brother, sisters". Jet. Johnson Publishing Company. 72 (25). September 14, 1987. ISSN 0021-5996. Retrieved December 20, 2009. ^ Taraborrelli (2004), pp. 115–117. ^ Taraborrelli (2004), pp. 137–142. ^ Taraborrelli (2004), pp. 143–146. ^ a b c d e f Collier, Aldore (May 27, 1985). "Rebbie, oldest sister, latest bloomer, in the Jackson family". Jet. Johnson Publishing Company. 68 (11). Retrieved October 11, 2009. ^ a b c d Wynn, Ron (June 21, 1988). "Rebbie is a solo Jackson". Star-Banner. Retrieved January 13, 2010. ^ a b c d e f g h i Hogan, Ed. "Rebbie Jackson biography". Billboard. Retrieved October 11, 2009. ^ Dineen (1993), p. 59. ^ a b c d e f g h i j Ditzian, Eric (July 23, 2009). "Michael Jackson's Sister Rebbie May Take Care Of Kids". MTV. Retrieved October 11, 2009. ^ Ditzian, Eric (June 26, 2009). "Michael Jackson's Family Tree: Janet, Rebbie, Marlon And More". MTV. Retrieved October 11, 2009. ^ Harry, Rich (October 13, 1984). "An Oddly Compatible Couple: Johnny Mathis, Husker Du Pop Music/singles". The Morning Call. Retrieved January 14, 2010. ^ Takiff, Jonathan (October 18, 1984). "The hot discs for gift-givers". Philadelphia Daily News. Retrieved January 14, 2010. ^ Tucker, Ken (September 16, 1984). "Rap and dance music: diverse performers are giving it a whirl". The Philadelphia Inquirer. Retrieved January 14, 2010. ^ "Sister Rebbie". The Daily Courier. November 11, 1984. Retrieved October 11, 2009. ^ McTavish, Brian (July 16, 1987). "Rebbie Jackson is ready for her to turn on the charts" (Payment required to access full article). Chicago Tribune. Retrieved October 11, 2009. ^ a b c "Rebbie Jackson chart history: R&B/hip-hop songs". Billboard. Retrieved October 11, 2009. ^ a b "Michael Jackson's sister to perform in Middlesboro" (Payment required to access full article). Lexington Herald-Leader. June 17, 1988. Retrieved October 11, 2009. ^ "Jacksons say no hard feelings". Wilmington Morning Star. April 3, 1989. Archived from the original on April 20, 2013. Retrieved October 11, 2009. ^ a b c d e "Rebbie Jackson releases hot new album, 'Yours Faithfully'". Jet. Johnson Publishing Company. 93 (23). May 4, 1988. ISSN 0021-5996. Retrieved October 11, 2009. ^ Mitchell, Quohnos (March 1998). "Yours Faithfully". Vibe. Vibe Media Group. 6 (2). ISSN 1070-4701. Retrieved December 20, 2009. ^ Harris, Chris (July 7, 2009). "Who Is Michael Jackson Memorial Performer Shaheen Jafargholi?". Rolling Stone. Retrieved July 22, 2009. ^ a b Anderson, Kyle (July 8, 2009). "Who Sang 'We Are The World' At Michael Jackson Memorial?". MTV. Retrieved July 22, 2009. ^ Powers, Anne (July 7, 2009). "Michael Jackson memorial: 'We Are the World,' 'Who's Lovin' You' and the final performances". Los Angeles Times. Retrieved July 22, 2009. ^ "Millions watch Michael Jackson's LA memorial". The Jerusalem Post. July 7, 2009. Archived from the original on July 6, 2013. Retrieved October 23, 2009. ^ Vena, Jocelyn (July 8, 2009). "Janet Jackson, Sisters Thank Fans After Michael Jackson Memorial". MTV. Retrieved October 23, 2009. ^ "Jackson's mother granted custody". BBC News. August 4, 2009. Retrieved November 9, 2009. ^ Deutsch, Linda (August 17, 2009). "Jackson had long history with estate executor". The Guardian. Retrieved January 11, 2010. ^ a b c Taraborrelli (2004), p. 35. ^ Taraborrelli (2004), p. 36. ^ Campbell (1993), p. 20. ^ Caitlin White (January 10, 2013). "Rebbie Jackson, Husband Death: Nathaniel Brown Loses Cancer Battle". The Boombox. Retrieved 27 June 2013. ^ "Rebbie Jackson chart history: Top 200 albums". Billboard. Archived from the original on June 22, 2010. Retrieved October 11, 2009. ^ "Rebbie Jackson chart history: R&B/hip-hop albums". Billboard. Retrieved October 11, 2009. ^ "Rebbie Jackson chart history: Hot 100". Billboard. Retrieved October 11, 2009. ^ "Ultratop Singles Chart Archives". Ultratop. ultratop.be. Retrieved September 29, 2009. Campbell, Lisa (1993). Michael Jackson: The King of Pop. Boston, Massachusetts: Branden. ISBN 0-8283-1957-X. Dineen, Catherine (1993). Michael Jackson: In His Own Words. London, England: Omnibus Press. ISBN 0-7119-3216-6. Taraborrelli, J. Randy (2004). The Magic and the Madness. Terra Alta, West Virginia: Headline. ISBN 0-330-42005-4. "You Send the Rain Away"
This page was last edited on 19 April 2019, at 03:28 (UTC).